Just completed 3 HWEPs of awesomeness. At this point, my HW collection of Corvettes and Chevelles has includes most of the available castings, but I’m still filling in some holes in the MBX department. Also, this excellent Buick Grand National, which I have already DLMed and it will be getting some more attention in the near future. I’d been able to find one C6R, but wanted another one for customizing (it will be black). Also, an RC pro-street Camaro, and a few more Ford Deliveries than I bargained for, so at least a de-tampo ahead. He was of great help finding some current things which I’d had no luck with. I’ve yet to see any of the wave of RR’s that included the Porsche, and my TRU and Walmart situations are both not great, so I had very little hope of finding the MBX Best Of cars or the Zamac. 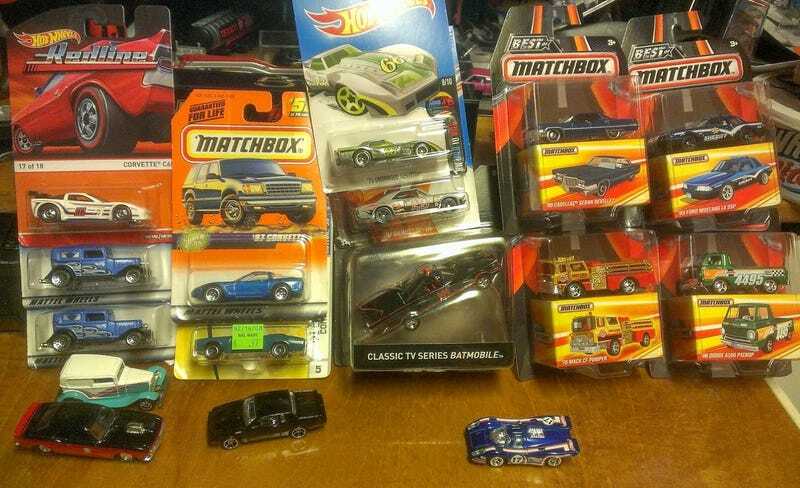 I had been assiduously looking for the Classic Batmobile to no avail and the Leap Year Chevelle had also eluded me, so these are all very welcome additions. Thanks, guys! Let’s do it again sometime.